News: the first commuters have travelled through Grimshaw's newly completed New York subway station and retail space, the Fulton Center. Grimshaw's new Lower Manhattan transit hub connects eleven New York City subway lines and the Port Authority Trans-Hudson (PATH) trains that serve the state of New Jersey. 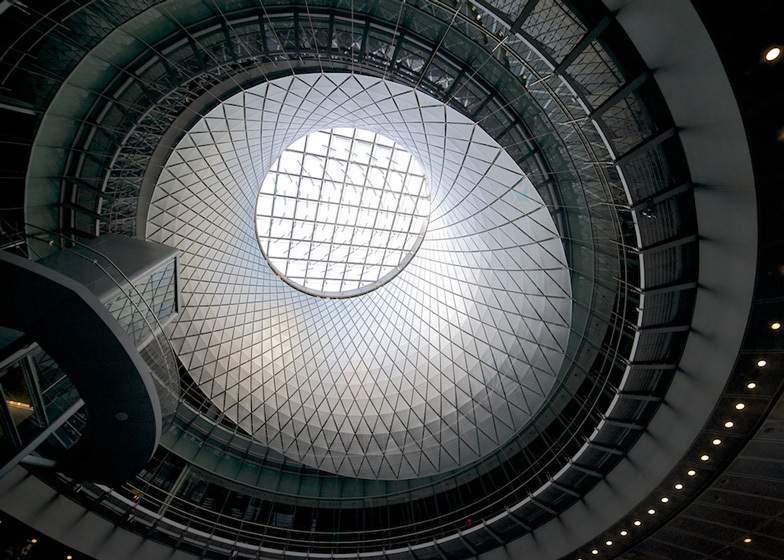 The Fulton Center, which opened to the public yesterday, is expected to receive over 300,000 daily commuters and form a "gateway to and from Lower Manhattan". The London architecture studio worked in collaboration with engineering firm Arup on the design for the station, which was commissioned by the Metropolitan Transportation Authority Capital Construction Company (MTA). "From the beginning, we were inspired by the ambience and activity of Grand Central Station," said Grimshaw project partner Vincent Chang. "We endeavoured to design a similar environment for transit customers and visitors, creating a new front door to downtown New York." The station is one in a series of schemes contributing to the redevelopment of Lower Manhattan, which this month has also seen the completion of One World Trade Center by Skidmore, Owings & Merrill. According to Grimshaw, the station "celebrates the city's history while looking forward to the area's future and its escalating growth." The structure comprises a glass box topped by a large glass and steel dome spanning 37 metres. An elliptical opening in the domed roof, surrounded by criss-crossing struts of steel, lets light stream into the concourse and platform levels. "Tapered steel columns draw inspiration from the historic neighbourhood's cast-iron buildings and complement the integration and restoration of the adjacent Corbin Building," said a statement from the studio. "The open design provides unimpeded customer movement and sight lines across a level ground plane extending from the major thoroughfares of Broadway and Fulton Street." A circular lightwell in the ground floor, directly below the atrium, funnels light into the lower ground platform areas. Passageways are artificially illuminated by an overhead grid of fluorescent tubes. To one side of the atrium a spiral staircase wraps around a glass-fronted elevator leading up to shops that curve around the central well. "The central architectural concept of redirecting natural light deep into the transit environment – in an effort to humanise the space and orient passengers – culminates in the design of the dome's interior and a new integrated artwork," said the studio. An artwork, called the Sky Reflector-Net, was commissioned for the space from New-York designer James Carpenter. The piece is made up of diamond-shaped sections of perforated metal and hangs like a hood from the roof opening, intended to mirror images of the changing sky above the station. "This new station makes traveling easier for subway riders, and is a beautiful public space for visitors and commuters to enjoy," said New York governor Andrew Cuomo. "We now have a new cornerstone in Lower Manhattan, and I am proud to see this unique complex opened to the public." For job opportunities at Grimshaw, visit their company profile on Dezeen Jobs.